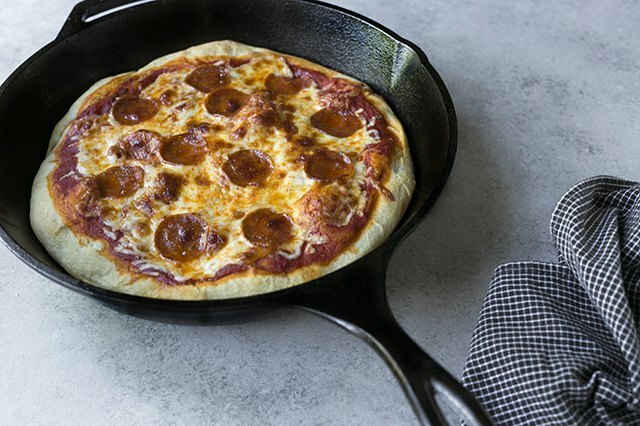 Cast iron skillet pizza is perfect for those who love a thick crust that's crispy on the outside and soft on the inside. 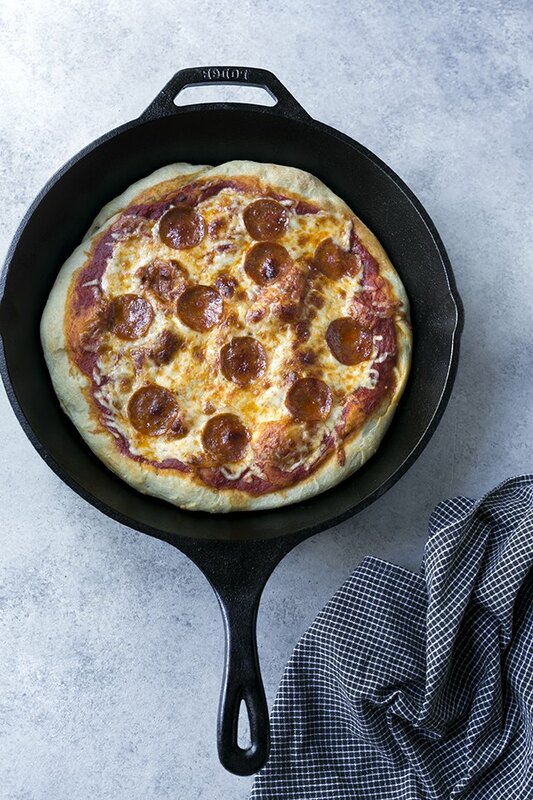 The cast iron not only makes for a beautiful presentation, it's an excellent alternative for those who don't own a pizza stone and/or peel. It can be prepared using store-bought dough and sauce, or you can work with your favorite recipes for a fully customizable treat. 12-inch seasoned cast iron skillet (a 10-inch skillet will also work). See tip at end of the article before you begin. Some grocery stores sell ready-to-use pizza dough, which will work fine for this recipe. 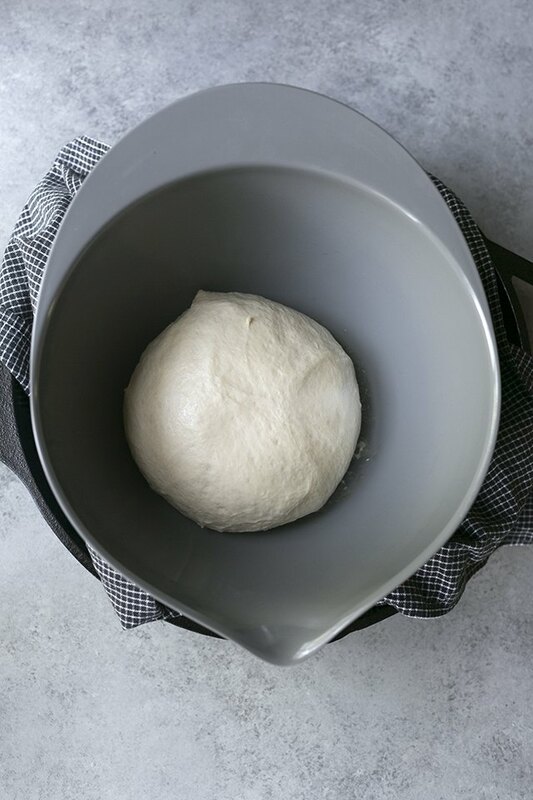 Feel free to use your favorite yeasted pizza dough. 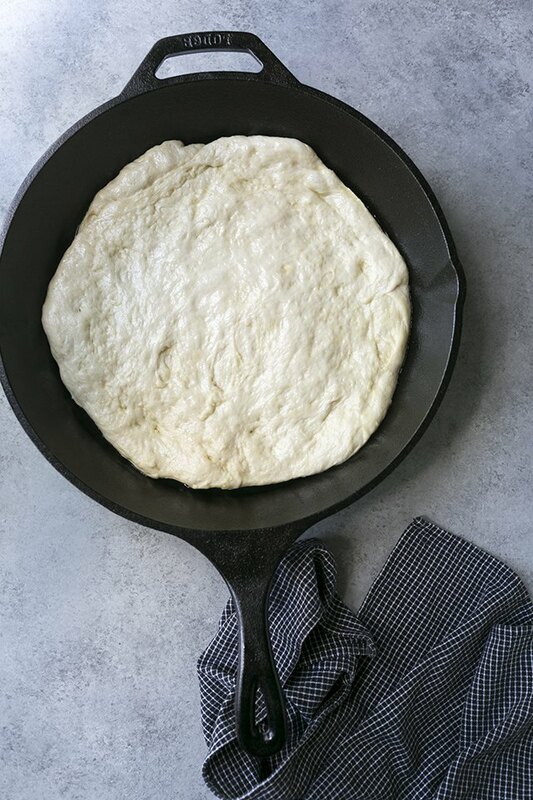 This New York-style dough recipe (adapted from The United States of Pizza, by Craig Priebe) will fit well into a 10 or 12-inch skillet. Place the flour, sugar and yeast in the bowl of a stand mixer fitted with the dough hook attachment. Turn on low speed briefly to combine ingredients. Add water and olive oil and mix for 2 to 3 minutes, until a ball forms. Turn off the mixer and allow the dough to rest of 10 minutes, then add the salt. Turn the mixer on medium speed and allow the dough to knead for 12 minutes. If the is very sticky after 12 minutes and not pulling cleanly away from the sides of the bowl, mix in an additional teaspoon of flour. Repeat 1-2 more times if needed. Grease a large bowl lightly with olive oil, add the dough and cover with a clean dish towel. Place in the refrigerator and chill overnight or up to 72 hours. Allow the dough to come to room temperature for 1 hour, covered, before using. Step 1: Spread the dough in well-oiled skillet. Add approximately 3 to 4 tablespoons of extra virgin olive oil to the bottom of the skillet. 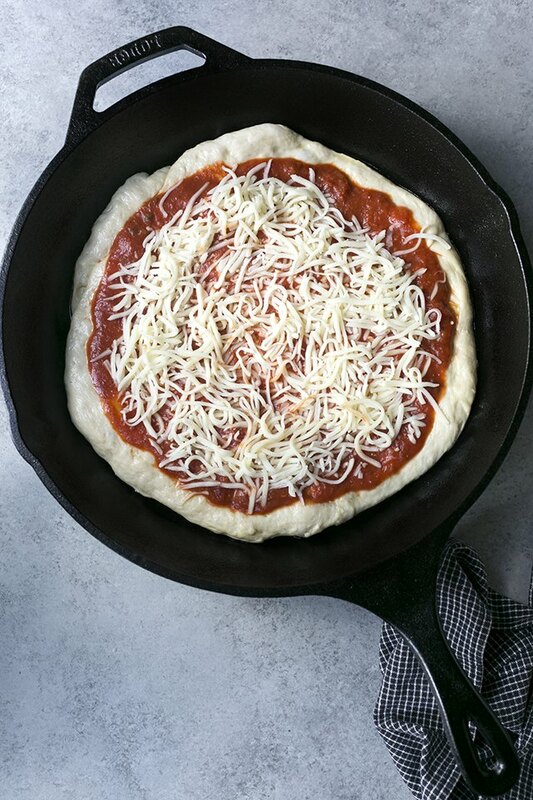 Place the pizza dough in the skillet and turn over so that both sides of the dough are covered in oil. Gently spread the dough out a bit, pressing down to help it start forming to the pan. Don't worry if the dough doesn't spread out all the way; it's not supposed to. Step 2: Allow the dough to rest in the skillet. Cover with a clean dish towel and let the dough rest for 1 hour, then check on it's progress. The yeast will have caused the dough to rise and spread. Gently press the dough further into the pan. If necessary, let the dough rest for an additional 30 minute to 1 hour, until it can completely fill the bottom of the skillet. During this time, preheat the oven to 500 degrees Fahrenheit. Step 3: Add the pizza sauce. 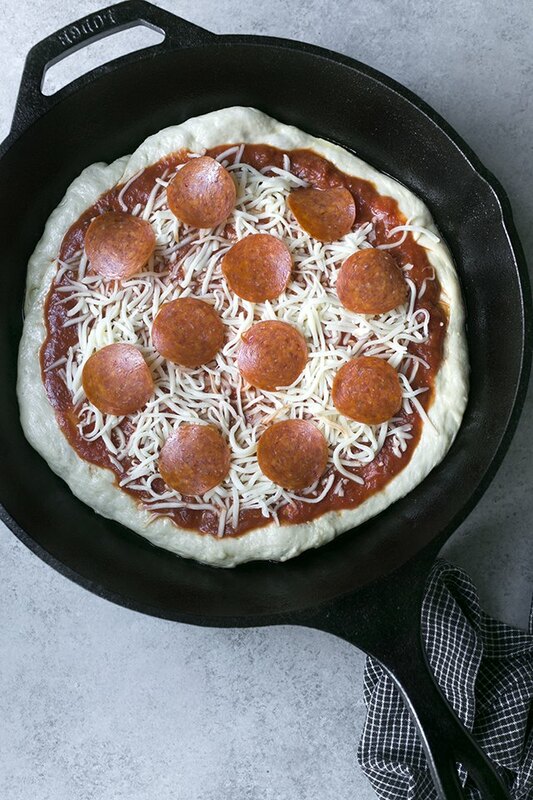 Spread pizza sauce over the dough. You can use either your favorite store brand, or you can prepare it from scratch. Mozzarella is the typical choice for pizza, but feel free to get creative with a blend. Step 5: Add optional toppings. 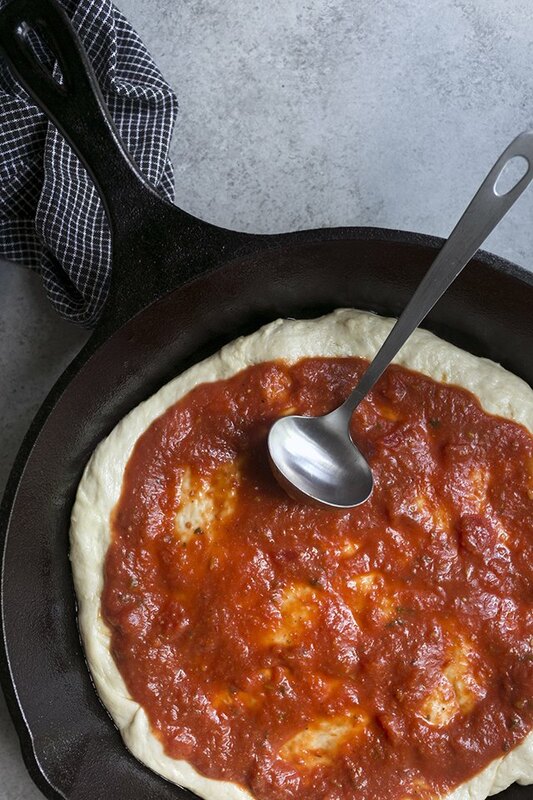 Any of your favorite pizza toppings will work well on a skillet pizza. Step 6: Bake the pizza. Bake the pizza for approximately 12 to 15 minutes, until the dough is firm. Remove from the oven and serve immediately. Use oven mitts when handling the cast iron pan. 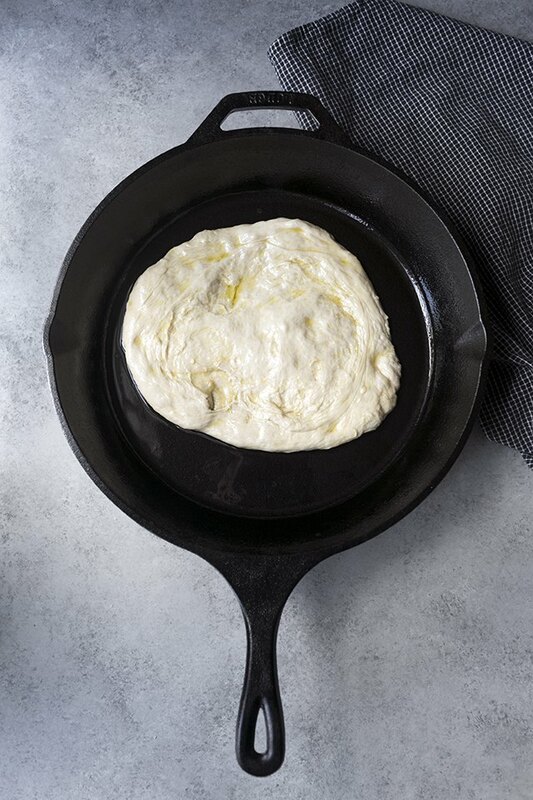 Cast iron gets very hot and retains that heat for longer than other cookware! It's important to use well-seasoned cast iron. This will help prevent the pizza from getting stuck. If your skillet needs to be seasoned, follow these steps: Preheat the oven to 325 degrees Fahrenheit. Use a firm scrubbing brush to clean the skillet on both sides under warm, soapy water, then thoroughly dry. Using a paper towel, brush a very thin layer of vegetable oil all over the skillet (there should be no excess dripping oil). Place the skillet directly on an oven rack, face down, and leave in the oven for 1 hour. Turn off the heat and allow to cool completely in the oven before removing. 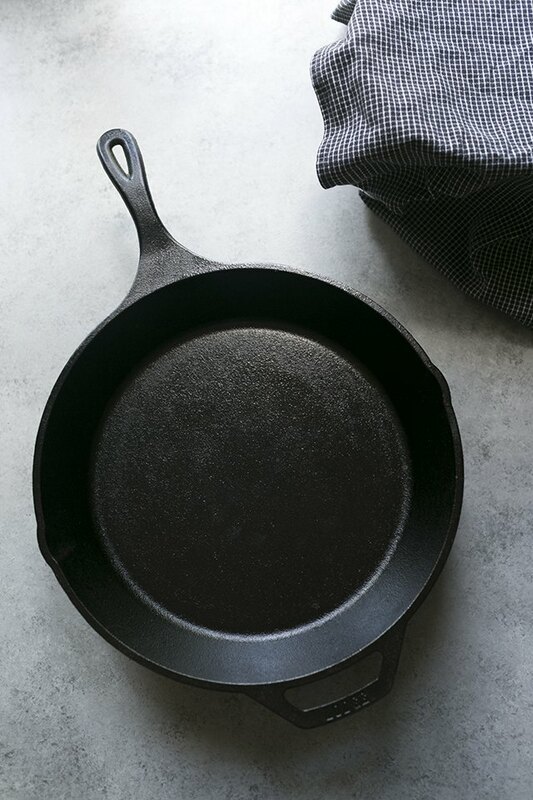 For cast iron skillets that need deeper cleaning and restoration, this tutorial will help. What Is a Skillet Pan?